The way we manage organizations seems increasingly out of date. Survey after survey shows that a majority of employees feel disengaged from their companies. The epidemic of organizational disillusionment goes way beyond Corporate America-teachers, doctors, and nurses are leaving their professions in record numbers because the way we run schools and hospitals kills their vocation. Government agencies and nonprofits have a noble purpose, but working for these entities often feels soulless and lifeless just the same. All these organizations suffer from power games played at the top and powerlessness at lower levels, from infighting and bureaucracy, from endless meetings and a seemingly never-ending succession of change and cost-cutting programs. Deep inside, we long for soulful workplaces, for authenticity, community, passion, and purpose. The solution, according to many progressive scholars, lies with more enlightened management. But reality shows that this is not enough. In most cases, the system beats the individual-when managers or leaders go through an inner transformation, they end up leaving their organizations because they no longer feel like putting up with a place that is inhospitable to the deeper longings of their soul. We need more enlightened leaders, but we need something more: enlightened organizational structures and practices. But is there even such a thing? Can we conceive of enlightened organizations? In this groundbreaking book, the author shows that every time humanity has shifted to a new stage of consciousness in the past, it has invented a whole new way to structure and run organizations, each time bringing extraordinary breakthroughs in collaboration. A new shift in consciousness is currently underway. Could it help us invent a radically more soulful and purposeful way to run our businesses and nonprofits, schools and hospitals? The pioneering organizations researched for this book have already "cracked the code." Their founders have fundamentally questioned every aspect of management and have come up with entirely new organizational methods. Even though they operate in very different industries and geographies and did not know of each other's experiments, the structures and practices they have developed are remarkably similar. It's hard not to get excited about this finding: a new organizational model seems to be emerging, and it promises a soulful revolution in the workplace. 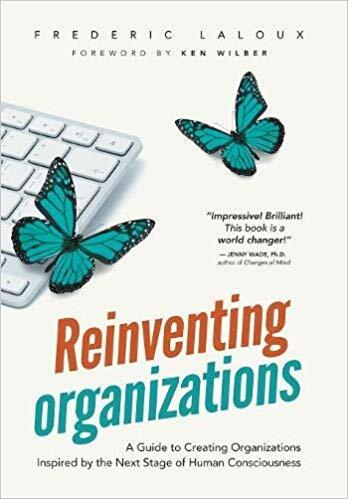 Reinventing Organizations describes in practical detail how organizations large and small can operate in this new paradigm. Leaders, founders, coaches, and consultants will find this work a joyful handbook, full of insights, examples, and inspiring stories.